The Hermes 90 tactical unmanned aircraft system can operate for up to 15 hours. The Hermes 90 UAS was unveiled at the Paris Air Show in June 2009. Image courtesy of Tangopaso. The Hermes 90 incorporates Micro CoMPASS electro-optic payload system. Hermes 90 is a light tactical unmanned aircraft system (UAS) designed and manufactured by Elbit Systems. The UAS can be operated in open terrain as well as urban warfare conditions. It is suitable for combat, homeland security, low intensity conflicts, and peace keeping missions. It can also be deployed for other military and non-military applications. Elbit Systems unveiled the Hermes 90 at the Paris Air Show in June 2009. The company conducted a flight test of the Hermes 90 with heavy fuel engine in September 2009. Elbit Systems also displayed the Hermes 90 UAS during the Defexpo India 2014 held in February in New Delhi, India. The UAS is offered in the US market as STORM. The STORM tactical UAS is being produced by UAS Dynamics, a joint venture between General Dynamics and Elbit Systems, to meet the requirements of the US defence and other state-owned customers. 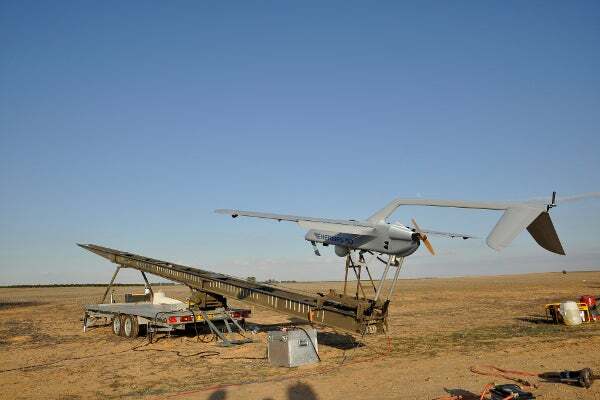 UAS Dynamics successfully conducted a flight test of the STORM UAS integrated with a Ku-band communication data link (CDL) in March 2010. Hermes 90 is a low cost tactical UAS with high survivability and long endurance. Derived from the Innocon Mini Falcon II UAV, the Hermes 90 is ideally suited for deployment by the manoeuvring forces. The UAS has a wing span of 5m and can take-off with a maximum weight of 115kg. It is runway independent and can operate in a fly by camera mode which is used by all UAS in the Hermes family. "It is runway independent and can operate in a fly by camera mode which is used by all UAS in the Hermes family." The Hermes 90 supports automatic dual launch and recovery methods to operate as per the requirements and terrain features. It does not require any dedicated ground equipment and can be launched by an integral launcher allowing point launch and recovery from unprepared surfaces. The system also supports take off and landing from short runways. The Hermes 90 UAS incorporates MicroCoMPASS electro-optic payload system that allows the UAS to perform exceptional intelligence and surveillance missions in all weather conditions. The lightweight and compact MicroCoMPASS system consists of a colour TV day camera with charge-coupled device (CCD) detector, forward looking infra-red (FLIR) night camera, a laser marker, and a third generation thermal imager. It is also equipped with an eyesafe laser range finder and laser illuminator. The thermal night camera offers continuous magnification to enable observation of a wide field. The Hermes 90 can also be integrated with a variety of high-quality mission payloads, such as COMINT (communications intelligence), communications relay, synthetic aperture radar (SAR) / ground moving target indicator (GMTI), and large area mapping and scanning systems. "The Hermes 90 can be monitored and controlled by a mobile or fixed universal ground control station (UGCS)." The Hermes 90 can be monitored and controlled by a mobile or fixed universal ground control station (UGCS). The small shelter based UGCS can be installed on small 4WD vehicles. It consists of a ground data terminal, a remote video terminal, and a flight line tester / loader. The system allows the operator to perform mission editing and payload control in real-time. The UGCS is integrated with C4I systems that facilitate rapid dissemination of imagery and ensure easy coordination among the operational forces in action. The UAS is equipped with an engine that burns heavy fuel, allowing for refuelling, launch and recovery on naval platforms and ships. The Hermes 90 can carry a maximum payload of 25kg and has a range of up to 100km. It can continuously operate for up to 15 hours. The service ceiling of the UAS is 15,000ft.